Joseph Chamberlain (8 July 1836 – 2 July 1914) was a British politician and statesman, who was first a radical Liberal then, after opposing Home Rule for Ireland, a Liberal Unionist, eventually serving as a leading imperialist in coalition with the Conservatives. He split both major British parties in the course of his career. 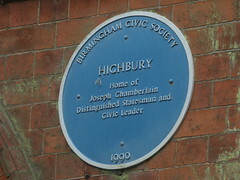 Chamberlain made his career in Birmingham, first as a manufacturer of screws and then as a notable Mayor of the city. He was a radical Liberal Party member and a proponent of the Elementary Education Act 1870. As a self-made businessman, he had never attended university and had contempt for the aristocracy. He entered the House of Commons at 39 years of age, relatively late in life compared to politicians from more privileged backgrounds. Rising to power through his influence with the Liberal grassroots organisation, he served as President of the Board of Trade in Gladstone's Second Government (1880–85). At the time, Chamberlain was notable for his attacks on the Conservative leader Lord Salisbury, and in the 1885 general election he proposed the "Unauthorised Programme", which was not enacted, of benefits for newly enfranchised agricultural labourers, including the slogan promising "three acres and a cow". Chamberlain resigned from Gladstone's Third Government in 1886 in opposition to Irish Home Rule. He helped to engineer a Liberal Party split and became a Liberal Unionist, a party which included a bloc of MPs based in and around Birmingham. From the 1895 general election the Liberal Unionists were in coalition with the Conservative Party, under Chamberlain's former opponent Lord Salisbury. In that government Chamberlain promoted the Workmen's Compensation Act 1897. He served as Secretary of State for the Colonies, promoting a variety of schemes to build up the Empire in Asia, Africa, and the West Indies. He had some responsibility for causing and directing the Second Boer War (1899–1902) and was a dominant figure in the Unionist Government's re-election at the "Khaki Election" in 1900. In 1903, he resigned from the Cabinet to campaign for tariff reform (i.e. taxes included in the prices of imports instead of free trade). He obtained the support of most Unionist MPs for this stance, but the Party's split led to its landslide defeat at the 1906 general election. Some months later, shortly after public celebrations of his 70th birthday in Birmingham, he was disabled by a stroke, ending his public career. Despite never becoming Prime Minister, he was one of the most important British politicians of the late 19th and early 20th centuries, as well as a renowned orator and divisive politician. Winston Churchill later wrote of him that he was the man "who made the weather". Chamberlain was the father, by different marriages, of Sir Austen Chamberlain and Prime Minister Neville Chamberlain. 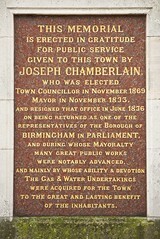 This Memorial is erected in gratitude for public service given to this town by Joseph Chamberlain, who was elected Town Councillor in November 1869 Mayor in November 1873, and resigned that office in June 1876 on being returned as one of the borough of Birmingham in Parliament, and during whose mayoralty many great public works were notably advanced, and mainly by whose ability & devotion the Gas & Water undertakings were aquired for the town to the great and lasting benefit of the inhabitants. 1903 In commemoration of the visit paid to South Africa by the Right Hon. 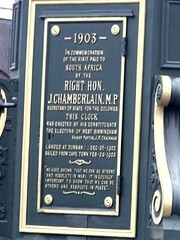 J. Chamberlain MP Secretary of State for the Colonies, This clock was erected by his constituents the electors of West Birmingham Henry Payton, J. P. Chairman. Landed at Durban: : Dec-26-1902 Sailed from Cape Town Feb-25-1903 "We have shown that we can be strong and resolute in war: it is equally important to show that we can be strong and resolute in peace".